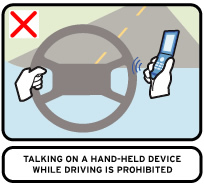 Effective March 1, 2008 New Jersey law makes using a hand-held communications device a primary offense. Authorities will issue a $100 fine to any driver caught violating this law, although no points will be issued to the license. Although it is discouraged, drivers may use a hands-free device if it does not interfere with standard safety equipment. “Use” of a wireless phone and any other hand-held communication device includes, but is not limited to, talking or listening to another person, texting, or sending and receiving electronic messages. 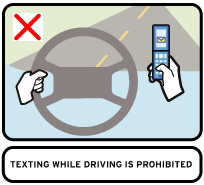 A hand-held phone may be used for an emergency only and the driver must keep one hand on the wheel at all times. In an effort to increase safety on the roads, this law will be enforced. According to the US National Highway Traffic Safety Administration, it is estimated that 25% of all police-reported traffic accidents are accountable to driving distraction from all sources, including cell phones. 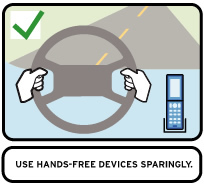 Use a hands-free unit so that both of your hands are on the steering wheel at all times.